We had a few left-over roast potatoes and some extra spinach from making torteverde and thought they might be good in an omelette. They are!! We use left-over roast potatoes from the evening before. If don't have any left-over roast potatoes: wash and cube unpeeled potatoes (we prefer Yukon Gold). Drizzle with olive oil, sprinkle with seasalt and bake in a shallow dish until they are a little crisp on the outside and soft inside. (oven at around 350F for 30 to 40 minutes). This step too can be done the night before. Wash spinach well and put it in a colander. Sprinkle with table salt (1½ Tbsp for a large bunch of spinach). Toss to mix and set aside to drain 20 minutes. When the spinach is limp, squeeze it out with your hands til it is quite dry. Discard juice. Set aside in a small bowl til ready to use. I am assuming that you already know how to make an omelette... at the appropriate time, add sliced potatoes, chopped spinach grated cheese. Be aware that the spinach, potatoes and cheese are already salted so you don't need to add as much salt as you might to a plain omelette. 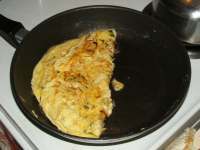 In an omelette pan, sauté onions in oil until they are just starting to caramelize. Add chillies and sauté for half a minute. Pour eggs into pan and cook until done. Serve garnished with fresh coriander leaves. This is a wonderful winter breakfast. Have plenty of coffee, fruit juice and flat bread (rotis) as well. Or, instead of coffee, serve "special" chai (Indian tea with ginger and cardamon) afterwards. Delicious! !